"Curious about apples? Gail Gibbons's book provides a clear, concise overview of apples, including their history, varieties, growth, harvesting, different parts, and uses. There are also quick facts about apples, a recipe for apple pie, and information on how to make apple cider. Bonnie Kelley Young reads the text slowly so that listeners can absorb all the facts and instructions and peruse the bright illustrations. Page-turn signals are optional. 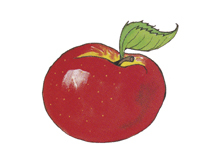 A good choice for elementary science units and to satisfy requests in the fall for books about apples."